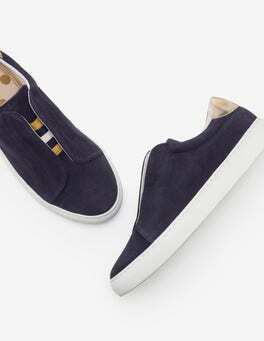 Sporty and fun, these trainers are the casual shoe for busy lives. Crafted from soft leather, they're comfortable all day long and you can choose between block colours with grosgrain strip or embroidered patterns with contrasting heel-top. Running errands has never looked (or felt) so good. 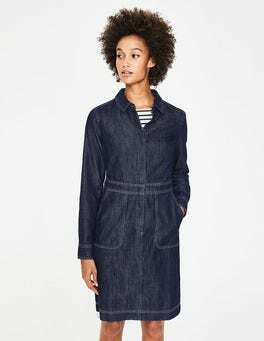 …denim shirt dress. A waist panel flatters the figure and the pocket detail gives it a laid-back appeal. Coupled with buttons down the front that can be fastened all the way to the top or left open, this is one versatile piece. Roll up the long sleeves and team with trainers for running errands. The comfiest way to add height without slowing you down – these flatform trainers can be as casual as you like. Why not twin them with a sharp trouser suit for nonchalant chic? 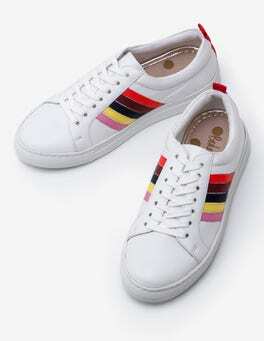 A rainbow grosgrain stripe at the back livens up the neutral and versatile colours.